Q1: which gets heated faster land or water? Q2: which gets cooled faster land or water? Q3. How is ozone molecule differ from oxygen molecule? Ans: Triatomic ozone is a poisonous while diatomic oxygen is life giving agent. Q4. Name a man made chemical substances that harms ozone layer? Ans: Chloro fluro carbons (CFCs). Q5. Which part of ozone is there found a hole? Ans: There discovered a hole in the ozone layer above the Antartica. Q6. Name a atmospheric phenomenon, in which some gases prevent the escape of heat from the Earth. Q7. Name a major green house gas. Q8. List the four major green house gas. Ans: CO2, Methene, Carbon mono oxide and nitrous oxide. Q9: Name two pollutants which is responsible for acid rain. Ans: Nitrogen oxide and sulpher oxide. Q10: What is the main source of pollutants like Nitrogen oxide and sulpher oxide? Ans: Fossil fuels like coal and petroleum. Q1. Why is the process of nitrogen fixing not taken place in the presence of oxygen by bacteria? Ans: Some organisms like bacteria becomes poisonous by elemental oxygen, therefore the process of nitrogen fixing is not taken place in the presence of oxygen. Ans: In the upper reaches of the atmosphere, a molecule containing three atoms of oxygen is found. This would mean a formula of O3 and this is called ozone. Q3: How soil is so important resorces ? Ans: Soil is an important resource that decides the diversity of life in an area. The outermost layer of our Earth is called the crust and the minerals found in this layer supply a variety of nutrients to life-forms. Q4. What is the major function of ozone layer? (i) It absorbs harmful radiations from the Sun. (ii) This prevents those harmful radiations from reaching the surface of the Earth where they may damage many forms of life. Q5. What is chloro fluro carbons (CFCs) ? Ans: It is a carbon compounds having both fluorine and chlorine which is very stable and not degraded by any biological process. Once this CFCs compound reached the ozone layer, they would react with ozone molecule and causes ozone reduction. Q6. What are biotic components? Ans: There are many living components present in biosphere. These living components are called biotic components. Example: trees, plants, animals, micro organisms etc. Q7. What are abiotic components ? Ans: There are so many non-living components in a biosphere along with living components, these non-living components are known as abiotic components. Example: soil, water, air, temperature etc. Q8. What is biogeochemical cycles? Ans: A constant interaction between the biotic and abiotic components of the biosphere makes it a dynamic process, but stable system. These interactions consist of a transfer of matter and energy between the different components of the biosphere and forms a cycles, such cycles are known as biogeochemical cycles. organisms that live in it, is called soil pollution. Q10: Write down the two main harmful effects of soil-pollution. (I) Soil-pollution reduces the fertility of the soil. (ii) It also kills the diversity of organisms that live in it. Q11: Write two ways by which carbone dioxide is fixed? (ii) many marine animals use carbonates dissolved in sea-water to make their shells. Ans: life-supporting zone of the Earth where the atmosphere, the hydrosphere and the lithosphere interact and make life possible, is known as the biosphere. Q13: How do convection currents produce? Ans: The atmosphere can be heated from below by the radiation that is reflected back or re-radiated by the land or water bodies. On being heated, convection currents are set up in the air. Q14: Write the factors which influence the winds? (ii) Rotation of the earth. (iii) Presence of mountain ranges in the paths of the wind. Q15: How does rain occur? expands and cools. This cooling causes the water vapour in the air to condense in the form of tiny droplets. By the ‘condensation’ of these water droplets. When the drops have grown big and heavy, they fall down in the form of rain. Q16: What are regions for rains in large parts of India? Ans: In large parts of India, rains are mostly brought by the southwest or north-east monsoons. Q17: What is acid rain? Ans: Nitrogen oxide and sulpher oxide are produced due to combustion of fossil fuels. They dissolve in air to give rise to acid rain. Q18: What is smog? What does it indicate? Ans: Presence of high levels of all pollutants cause visibility to be lowered, especially in cold weather when water also condenses out of air. This is known as smog. These indicate of air pollution. Q19: How are convection currents set up in the air ? Q19: What is global warming? what can be far-reaching consequences of global warming? Ans: Green house gases are rising up regularily in Earth's atmosphere, which obsorb the heat radiations coming from the sun. Hence our atmosphere works as blanket, so it prevents the escape of heat from the Earth. consequently, the world temperature rising up. This is known as global warming. (i) It causes fload and dry. (ii) Increasing in sea-water levels from melting grassley. (iii) Increasing in avarage temperature of world. Q20. What are the factors or processes that make soil? (i) The sun: Rocks expand on sun's heat during day and contract at night, this results in the formation of cracks on the surcafes of rocks causing breaking up into smaller pieces. (ii) Water: Fast flowing water often carries big and small particles of rock downstream. This causes loss in surface particles, thus soil is formed. (iii) Wind: Wind also caused rubing and breaking down rocks and also flows out sands one places to other. (iv) Lichen : Lichen grows on the surface of rocks and they release certain substances that cause the rock surface to powder down and form a thin layer of soil. Q21: How does lichen help in soil formation? Living organisms also influence the formation of soil. How? Ans: Lichen grows on the surface of rocks. While growing, they release certain substances that cause the rock surface to powder down and form a thin layer of soil. Other small plants like moss, are able to grow on this surface now and they cause the rock to break up further. Q22. In what forms oxygen is found in nature ? (i) It is found in the elemental form in the atmosphere to the extent of 21%. (ii) It also occurs extensively in the combined form in the Earth’s crust as well as also in the air in the form of carbon dioxide. (iii) In the crust, it is found as the oxides of most metals and silicon, and also as carbonate, sulphate, nitrate and other minerals. (iv) It is also an essential component of most biological molecules like carbohydrates, proteins, nucleic acids and fats (or lipids). Q23. Describe nitrogen-cycle with the help of diagram. Ans: There are many forms of nitrogen atoms present in nature. Some special bacteria living in plants roots converts atmospheric nitrogen into nitrates and nitrites, these nitrates and nitrites are further converted into amino acid by the plant to synthesise them protiens and other complex compound which is consumed by animals as food. Once the animal or the plant dies, other bacteria in the soil convert the various compounds of nitrogen back into nitrates and nitrites. A different type of bacteria converts the nitrates and nitrites into elemental nitrogen. 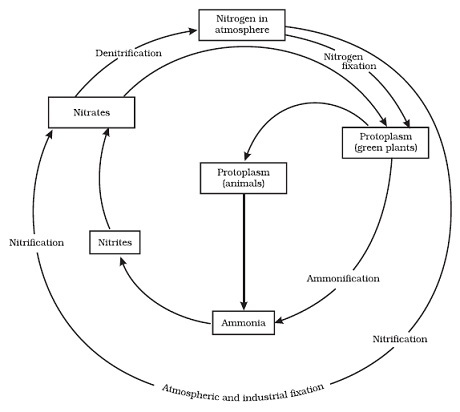 Thus forms a cycle in nature which is called Nitrogen-Cycle. Q24. 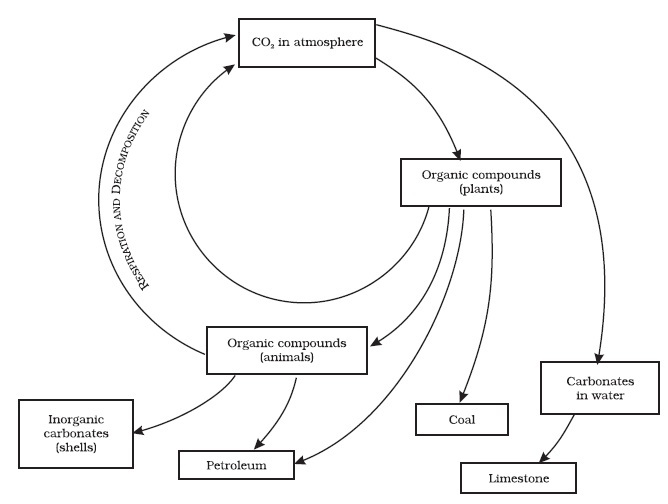 Describe Carbon-cycle with the help of diagram. Ans: All life-forms are based on carbon-containing molecules like proteins, carbohydrates, fats, nucleic acids and vitamins. Green plants uses CO2 in photosynthesis to form glucose molecules in presence of sunlight. These glucose molecules are provided to another living organisms as food energy or synthesis of other biologically important molecules like coal and pertroleum. After combustion of these fuels in various human activities it produces carbon dioxide that mixes in atmosphere. Living organisms uses food energy to convert glucose back into carbon dioxide in cellular respiration and produces carbon dioxide to atmosphere. Thus create a cycle in the nature by the various physical and biological activities is known as carbon-cycle. Q25. 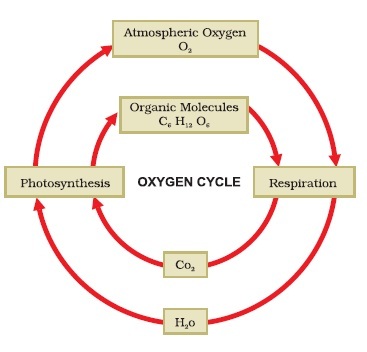 Describe oxygen-cycle with the help of diagram. combustion, respiration and in the formation of oxides of nitrogen. Oxygen is returned to the atmosphere in only one major process, that is, photosynthesis. And this forms the broad outline of the oxygen-cycle in nature.